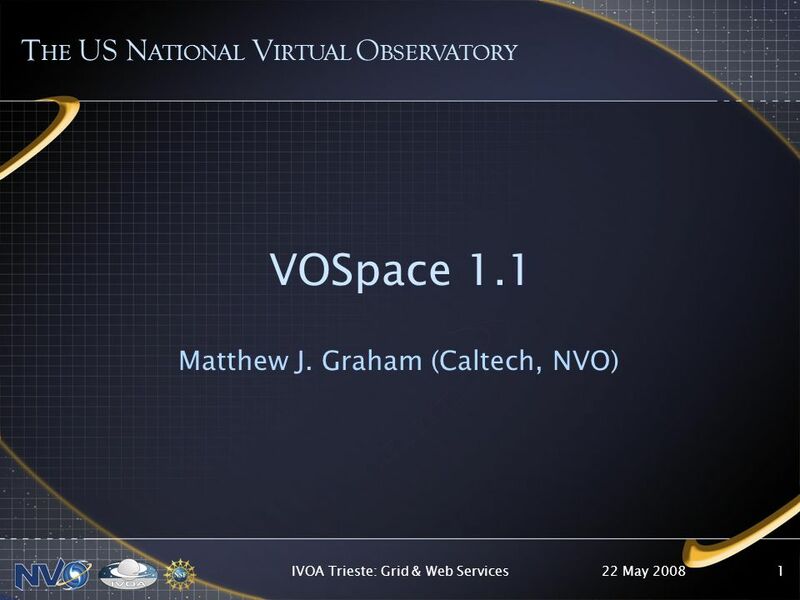 22 May 2008IVOA Trieste: Grid & Web Services1 VOSpace 1.1 Matthew J. Graham (Caltech, NVO) T HE US N ATIONAL V IRTUAL O BSERVATORY. 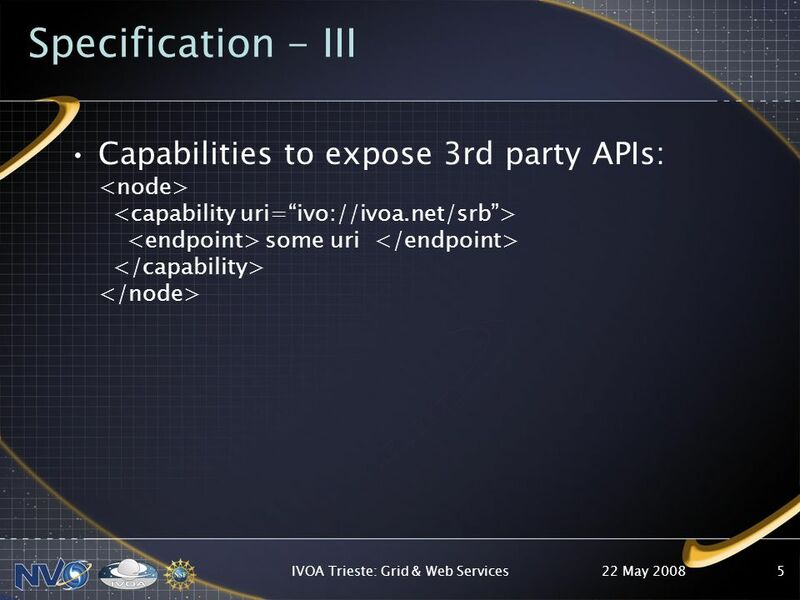 Download ppt "22 May 2008IVOA Trieste: Grid & Web Services1 VOSpace 1.1 Matthew J. Graham (Caltech, NVO) T HE US N ATIONAL V IRTUAL O BSERVATORY." EDBT04 – A Framework for Context-Aware Adaptable Web Services1 A Framework for Context-Aware Adaptable Web Services Markus Keidl and Alfons Kemper Universität. IVOA, Pune India September Data Access Layer Working Group Pune Workshop Summary Doug Tody National Radio Astronomy Observatory International. 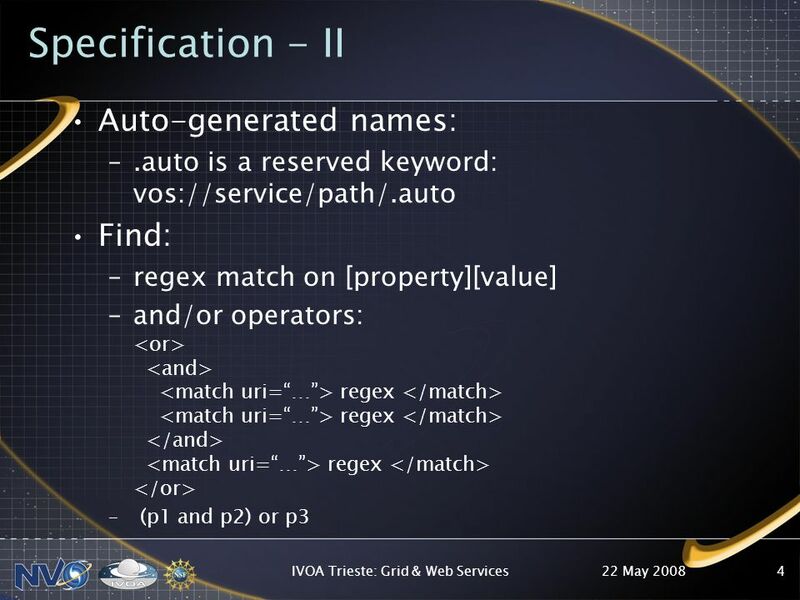 15 May 2007 IVOA Beijing: Grid & Web Services 21 Matthew J. Graham (Caltech, NVO) T HE US N ATIONAL V IRTUAL O BSERVATORY vs.
20 May 2008IVOA Trieste: Grid & Web Services/AstroRG1 Do we have our heads in the cloud? Matthew J. Graham (Caltech, NVO) T HE US N ATIONAL V IRTUAL O. 28 October 2008 IVOA Interoperability Meeting -- Baltimore T HE I NTERNATIONAL V IRTUAL O BSERVATORY ALLIANCE TAP/VOTable Registry Interface Reg 1 – G.
15 May 2007 Phillip Warner : NOAO : IVOA Interop1 NOAO VOEvent Services and Clients Phillip Warner, Rob Seaman, Chris Smith NOAO T HE US N ATIONAL V IRTUAL. May 2005IVOA Interoperability Meeting, Kyoto1 IRAF Web Services Michael Fitzpatrick NOAO T HE US N ATIONAL V IRTUAL O BSERVATORY. 18 May 2006 IVOA - Victoria: Registry 51 New resource types from VOEvent Matthew J. Graham Caltech T HE US N ATIONAL V IRTUAL O BSERVATORY. May IVOA Interop Meeting1 STScI/JHU Registry Status Gretchen Greene Wil OMullane T HE US N ATIONAL V IRTUAL O BSERVATORY. 23 May 2008 IVOA Interoperability Meeting -- Trieste T HE I NTERNATIONAL V IRTUAL O BSERVATORY ALLIANCE Resource Registries Closing Plenary Integration. IVOA Interop, May 2006 Slide 1 GWS-WG agenda and goals. GWS Status Recommendations: –None since Cambridge Proposed Recommendations: –None since Cambridge Working Drafts: –VOSpace 1.1* Internal Drafts: –VO-WS-Basic. 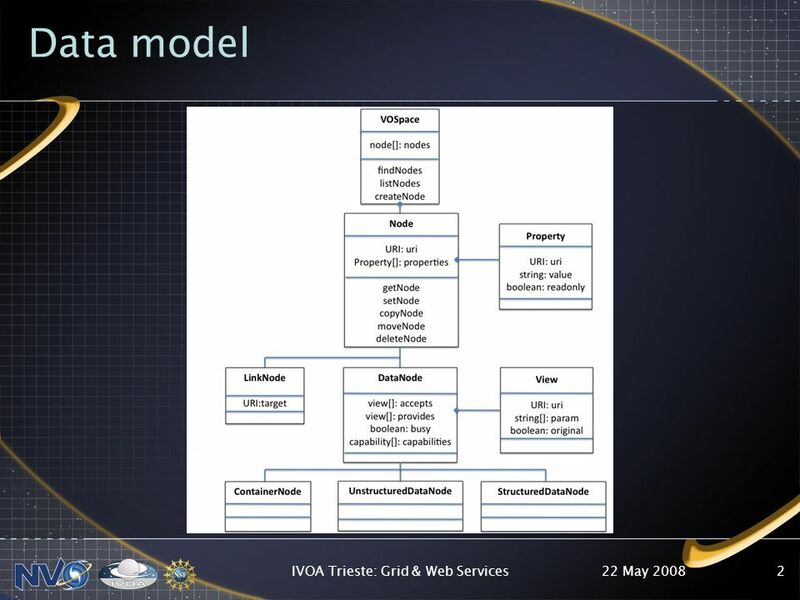 22 May 2008IVOA Trieste: Grid & Web Services1 Alternate security mechanisms Matthew J. Graham (Caltech, NVO) T HE US N ATIONAL V IRTUAL O BSERVATORY. Matthew J. Graham (Caltech) 27 May 2004 IVOA Interop Meeting Cambridge, MA CARNIVORE: The Caltech NVO Registry. 11 Sep 2006 NVO Summer School Managing data in the VO Matthew J. Graham CACR/Caltech T HE US N ATIONAL V IRTUAL O BSERVATORY. September 13, 2004NVO Summer School1 VO Protocols Overview Tom McGlynn NASA/GSFC T HE US N ATIONAL V IRTUAL O BSERVATORY. 8 Sep 2008NVOSS Web Services1 T HE US N ATIONAL V IRTUAL O BSERVATORY Introduction to Web Services Matthew J. Graham Caltech. 2008 NVO Summer School1 Finding Services in the NVO Registry Gretchen Greene T HE US N ATIONAL V IRTUAL O BSERVATORY. 8 September 2008NVO Summer School 2008 – Santa Fe1 Publishing Data and Services to the VO Ray Plante Gretchen Greene T HE US N ATIONAL V IRTUAL O BSERVATORY. DAY 20: ACCESS CHAPTERS 5, 6, 7 Larry Reaves October 28, 2013 1.